While Lower Manhattan is chock-full of skyscrapers, one in particular has a shiny top unlike any other in the country. 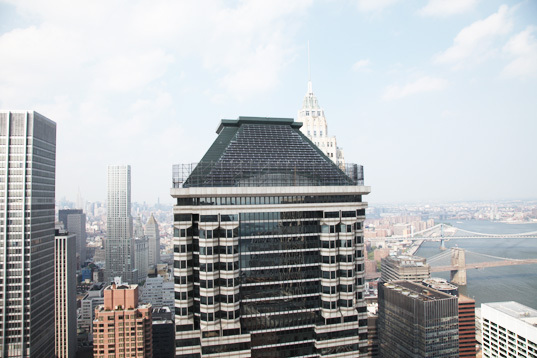 The Deutsche Bank American Headquarters at 60 Wall Street now dons a 122.4kW solar array that is not only the largest in Manhattan, but also the tallest flat panel PV array in the world, soaring 737 feet above ground. Part of the company’s global goal toward sustainable building, the newly installed array aims to reduce the carbon emissions of the building by 100 metric tons per year. The bank is planning to completely neutralize its CO2 emissions all over the world by next year. This may be entirely possible, as over the past four years, Deutsche Bank has increased its use of clean electricity from 7 to 65 percent. Currently, all of the bank’s purchased energy in America and Canada is generated from wind power. Work is already underway on a similar solar project at the bank’s nearby New Jersey office. While Lower Manhattan is chock-full of skyscrapers, one in particular has a shiny top unlike any other in the country. The Deutsche Bank American Headquarters at 60 Wall Street now dons a 122.4kW solar array that is not only the largest in Manhattan, but also the tallest flat panel PV array in the world, soaring 737 feet above ground. Part of the company's global goal toward sustainable building, the newly installed array aims to reduce the carbon emissions of the building by 100 metric tons per year.